PJM, the nation’s largest regional grid operator and the largest wholesale electricity market in the world, is at a crossroads: Can it run its markets while accommodating the ability of states to enact clean energy policies, or will it adopt new market rules that put the continuation of those policies at risk? With zero-emission credits (ZECs) supporting existing nuclear power plants in states like Illinois and New Jersey adding to the 29 states across the country already having renewable portfolio standards (RPS) that provide support in the form of renewable energy certificates (RECs) – and many of those states continuing to ratchet up RPS requirements – certain power plant operators have voiced concerns about what they see as “distortions” of the wholesale market. FERC is listening and making big moves. AEE is fully engaged in FERC’s proceedings, working to make sure that advanced energy resources are not disadvantaged in response. 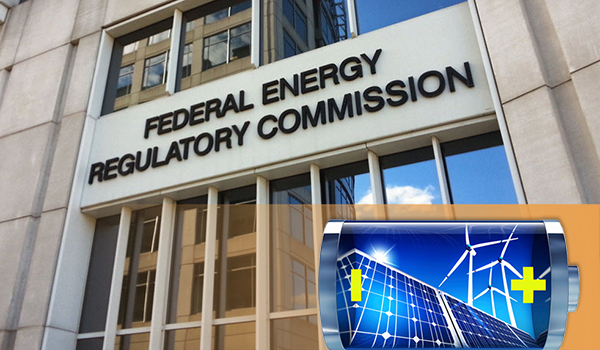 Last Thursday, the Federal Energy Regulatory Commission (FERC) released a long-awaited final order on its storage and distributed energy resource (DER) docket. This is a big step toward opening up the wholesale electricity markets under FERC jurisdiction to advanced energy technologies that have not been allowed to compete. Energy storage gets an immediate boost, as regional grid operators will now have to implement market rules to let energy storage participate. Aggregated DERs, which FERC considered in this proceeding at the urging of AEE, will be on a slower path, starting with a technical conference, but are also headed toward market participation. AEE and our member companies will stay engaged until these markets are truly open to all advanced energy technologies. Photo by vgm8383, used under a Creative Commons license. With snow seen up and down the East Coast (even in balmy Tallahassee for the first time in 30 years), not to mention the new phenomenon nicknamed “bomb cyclone,” which was both preceded and followed by record cold temperatures, there’s been ample opportunity for energy nerds to see how the grid is reacting to extreme winter weather – and policy wonks to consider the implications for the impending FERC decision on DOE’s proposal for subsidies to existing coal and nuclear power plants on the grounds of “resiliency” in the face of extreme weather events. But for those looking for proof of the need to prop up generating resources that are failing in the marketplace, the winter weather of the past week offered cold comfort. AEE has seen efforts to roll back energy efficiency requirements before, from the ongoing struggle to maintain Ohio’s successful efficiency standards in the face of legislative attacks and attempts to let big companies opt out of energy efficiency programs in Pennsylvania to the Trump Administration’s suspension of EE rules for central air conditioning. But this year, we saw something new: an attack on energy efficiency in the wholesale markets. As with other challenges to this money-saving advanced energy technology, AEE has taken it on.